Provide comfort for the family of Edna Fisher with a meaningful gesture of sympathy. 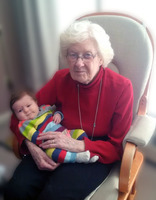 Edna Eunice Fisher of Calgary passed away April 3, 2019, at the age of 93. Edna is survived by her two sons Gregg (Carol) Fisher and Bruce (Lori) Fisher. She is also survived by nine Grandchildren and 5 Great-Grandchildren. Edna was predeceased by her husband John Alexander Fisher and her son John (Rose) Fisher. We will profoundly miss a most wonderful Mother, Grandmother and Great-Grandmother. We celebrate her loving kind spirit and her eventful 93 years. To view and share photos, condolences and stories of Edna please visit www.choicememorial.com. Arrangements entrusted to the care of Choice Memorial Cremation & Funeral Services (403) 277-7343.